Roy Moore is coming to my town. He's the former Alabama Chief Justice who snuck into the Alabama Judicial Building in the middle of the night three years ago and plunked down a 5,280-pound rock chiseled with the Ten Commandments. He paid for that with his job, after being given many chances to think better of his misdeeds. Since he lost his full-time job on the bench and his part-time job in interior decorating, he's been working full-time from the bully pulpit, preaching to the choir. That explains how Lancaster County, Pennsylvania, made his itinerary. This is about as "choir" as it gets. Moore is coming here as one of the featured speakers at the Constitution Party's "Biblical Foundations of American Law" conference. I think I'll give it a miss, though the other speaker, Alan Keyes, is always enlightening and interesting. Moore, on the other hand, will be drearily predictable. What struck me, though, in the article we ran previewing the speech, was the picture of Moore, standing beside his famous boulder. The Commandments are on the top of it, but around the sides are various quotes from political and legal men. You can read the ones on the side facing the camera. They're the type of one-sentence quotations that Fundamentalists love to cite to "prove" America's Christian foundation. I was pleased to see they numbered none of the usual bogus "Wall Builders" quotations, the ones continually attributed to the Founders but which have been proven to exist nowhere in their works. But a flagrant lie is just one way of turning the truth on its head. There are more subtle ways. Well, there it is, you secular humanists. Right there in black and granite. No less a light among the Founders that James Madison wants you to bow down and acknowledge that man's law is subordinate to God's. Maybe. The first "which" gives it away that this is a clause, not a full sentence. But you'd never know that otherwise, since the monumental carvers began it with a capital letter, which technically makes it a mis-quote. "The first question is answered at once by recurring to the absolute necessity of the case; to the great principle of self-preservation; to the transcendent law of nature and of nature's God, which declares that the safety and happiness of society are the objects at which all political institutions aim, and to which all such institutions must be sacrificed." Fitted into its context, the clause becomes much less important. Madison isn't writing about God or religion. He's writing about some "case," and invoking the "great principle of self-preservation," and cloaking it in the mantle of the deity, perhaps hyperbolically, to make his point seem unobjectionably sensible. It's from the Federalist Papers, those masterpieces of argument designed to convince a skeptical public to accept the new form of government that had been drawn up in Philadelphia in 1787. To be exact, it's from Federalist no. 43, which bears a date of Jan. 23, 1788. 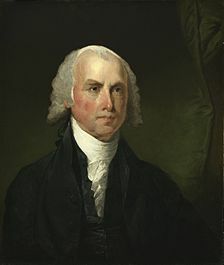 It is one in a sequence of pieces in which Madison, Hamilton, and Jay justified the creation of a new system of government -- after all, as everyone then knew, the Philadelphia Convention had been called to propose changes to the Articles of Confederation, not to scrap them and start over. That the delegates emerged from that secret convention with an entirely new Constitution was a serious breech of their stated legal purpose. Such a radical change might require that, since all the states had committed to the old Confederation, all of them would have to accept the new Constitution before it would go into effect. But that was highly unlikely -- Rhode Island was having none of it in 1788. Madison knew all this, and he argued strenuously to put this objection to rest. He was a good politician. The record and the authorities were not on his side. So he appealed to higher authority. Mostly to common sense. In that one case, to the natural law of self-preservation. Within it, as a parenthetical within a clause, he mentions the word "God." 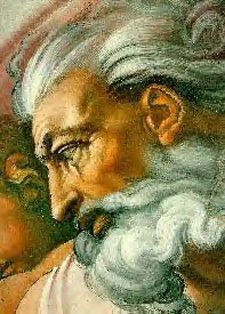 And in fact, he ditches God almost as soon as he conjures him. Because he's got a better argument: the system by which the Articles of Confederation were ratified was defective, because in many cases state legislatures, not the people, had voted on them. The new constitution will take its approval directly from the power of the people, assembled in state conventions. The confederation is fatally flawed because it is a treaty. The new system, rooted in the will of the people, will be greater and stronger. I find very little in that about big rocks in public buildings, graven with ancient religious codes. But evidently Judge Moore can find it. Two questions of a very delicate nature present themselves on this occasion. 1. On what principle the confederation, which stands in the solemn form of a compact among the States, can be superceded without the unanimous consent of the parties to it? 2. What relation is to subsist between the nine or more States ratifying the Constitution, and the remaining few who do not become parties to it. The first question is answered at once by recurring to the absolute necessity of the case; to the great principle of self-preservation; to the transcendent law of nature and of nature's God, which declares that the safety and happiness of society are the objects at which all political institutions aim, and to which all such institutions must be sacrificed. Perhaps also an answer may be found without searching beyond the principles of the compact itself. It has been heretofore noted among the defects of the Confederation, that in many of the States, it had received no higher sanction than a mere legislative ratification. The principle of reciprocality seems to require, that its obligation on the other States should be reduced to the same standard. A compact between independent sovereigns, founded on ordinary acts of legislative authority, can pretend to no higher validity than a league or treaty between the parties. It is an established doctrine on the subject of treaties, that all the articles are mutually conditions of each other; that a breach of any one article is a breach of the whole treaty; and that a breach committed by either of the parties absolves the others; and authorises them, if they please, to pronounce the treaty violated and void. Should it unhappily be necessary to appeal to these delicate truths for a justification for dispensing with the consent of particular States to a dissolution of the federal pact, will not the complaining parties find it a difficult task to answer the MULTIPLIED and IMPORTANT infractions with which they may be confronted? The time has been when it was incumbent on us all to veil the ideas which this paragraph exhibits. The scene is now changed, and with it, the part which the same motives dictate. The second question is not less delicate; and the flattering prospect of its being merely hypothetical, forbids an over-curious discussion of it. It is one of those cases which must be left to provide for itself. In general it may be observed, that although no political relation can subsist between the assenting and dissenting States, yet the moral relations will remain uncancelled. The claims of justice, both on one side and on the other, will be in force, and must be fulfilled; the rights of humanity must in all cases be duly and mutually respected; whilst considerations of a common interest, and above all the remembrance of the endearing scenes which are past, and the anticipation of a speedy triumph over the obstacles to re-union, will, it is hoped, not urge in vain MODERATION on one side, and PRUDENCE on the other. Don't believe every pro-religion quote thrown at you. Bogus quotes circulate endlessly, supposed to prove that America was founded as a "Christian nation." Christian historical revisionist David Barton of WallBuilders Inc. found them in dubious sources, or misread commentary as citation, and then spread a great many counterfeit quotations by Madison ("We have staked the future of the American civilization not on the power of government, but on the capacity of Americans to abide by the Ten Commandments of God") and others. He kept on spreading them after historians began to point out that these quotations cannot be found in any known writings or archives. Barton himself finally asked his followers to stop using them ... sort of. "To those who have used the above quotations, do not be discouraged. They have a source. We are simply unable to take them to an original, primary document, which is the standard for which we must all strive," he writes. And then he adds weasel-words euphemism for "we were wrong": "In this regard, we have traversed the learning curve." But still the fake words spread and now they have been read into the "Congressional Record" by one ignoramus or another in support of one or another pro-Christian bill. Other quotes that were actually said or written by ministers or other evangelical figures are attributed to important political figures like Abraham Lincoln. The mind being created free by the author of our nature, in vain have the arts of man endeavoured to shackle it: it may indeed be imprisoned a while by ignorance, or restrained from a due exertion of its powers by tyranny and oppression; but let the rays of science, or the dawn of freedom, penetrate the dungeon, its faculties are instantly rarified and burst their prison. This right of personal opinion, comprehends first, liberty of conscience in all matters relative to religion; and, secondly, liberty of speech and of discussion in all speculative matters, whether religious, philosophical, or political. Do we still believe it is true and a right of all people everywhere, as our Englightenment founders believed? Or of a lucky few only, and by them to be bargained and bartered for order and safety and unoffensiveness? Atheism leaves us to the full influence of most of our natural feelings and social principles; and these are so strong in their operation, that, in general, they are a sufficient guard to the order of society. But superstition counteracts these principles, by holding forth men to one another as objects of divine hatred; and by putting them on harrassing, silenceing, imprisoning and burning one another, in order to do God service. ... Atheism is a sanctuary for vice, by taking away the motives to virtue arising from the will of God, and the fear of future judgment. But superstition is more a sanctuary for vice, by teaching men ways of pleasing God, without moral virtue; and by leading them even to compound for wickedness, by ritual services, by bodily penances and mortifications; by adoring shrines, going pilgrimages, saying many prayers, receiving absolution from the priests, exterminating heretics, &c. ... Atheism destroys the sacredness and obligation of an oath. But is there not also a religion (so called) which does this, by teaching, that there is a power which can dispense with the obligation of oaths; that pious frauds are right, and that faith is not to be kept with heretics. St. George Tucker, perhaps nowadays the most overlooked and underrated patriotic genius of the first generation of the American Republic. © January 24, 2004 Douglas Harper Moe: "Say, what's a good word for scrutiny?" Shemp: "uh ... SCRUTINY!"